Here's a fresh take on chicken and pasta! Baked chicken is served alongside a quick toss of fettuccine pasta, tomatoes, asparagus and parmesan. Swap out the chicken for fish or pork and you've got a few other weeknight options that are sure to please. Preheat oven to 400°F. 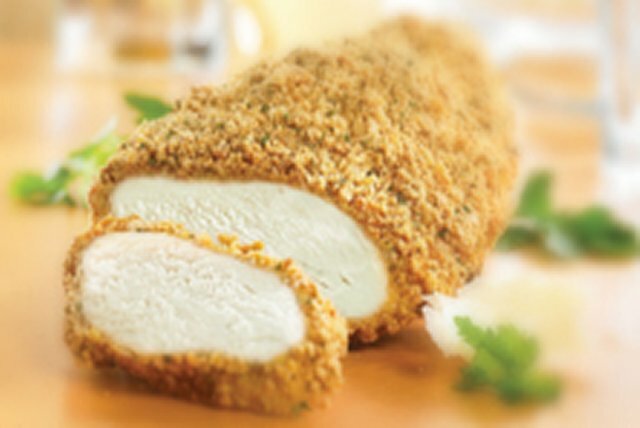 Coat 4 small boneless skinless chicken breasts (1 lb./450 g) with 1 pouch Shake 'N Bake Classic Herb & Parmesan Crusted for chicken, fish or pork; place on baking sheet. Bake 20 min. or until cooked through (170°F). Meanwhile, cook 1 pkg. (375 g) fettuccine as directed on package. While pasta is cooking, cook 1 undrained can (19 fl oz/540 mL) diced tomatoes in large saucepan on medium-high heat 5 min. Add 1/2 lb. (225 g) asparagus spears, cut into 2-inch lengths; cook 5 min. or until crisp-tender. Drain pasta; toss with asparagus mixture. Place on four serving plates; sprinkle with 1/2 cup Kraft 100% Parmesan Shredded Cheese. Serve with sliced chicken. Not only do the tomatoes in this crispy chicken dish provide a good source of vitamin C, but the cheese also provides a good source of calcium.